Since 2010 I’ve been hearing from internet marketers to start a blog. I am not a writer and for years I dodged this advice. But the more time I spend running a website design business the more I see its importance. 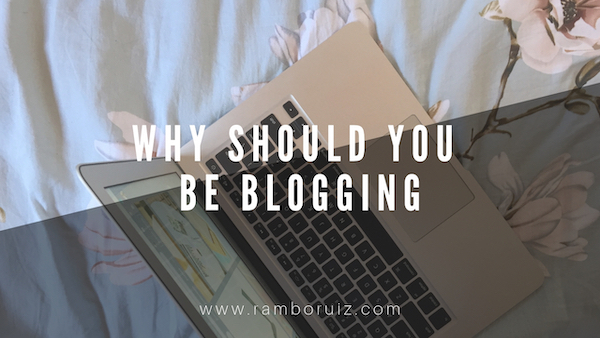 If you are running a business that is internet-dependent here are four reasons why you should be blogging. Websites with a blog have 434% more chance to rank higher on search engines. The return of investment (ROI) is 13x more for businesses that regularly publish blogs. Readers consider blogs as the 5th most trusted source of information online. A whooping 409 million people view as many as 22.2 billion blogs every month. Aside from the numbers, there are many non-measurable reasons why you should start a blog. A large part of keeping a blog is writing. If you don’t write then you don’t blog (unless you hired a professional to write for you). Just the same, at one point or another, you have to write an entry…or two… or three…or more by yourself. The good news is you don’t have to be a great writer to start a blog (obviously, I’m not). You just need to have the desire to write, and you’re good to go. With constant practice, your writing skills will improve. And having good writing skills gives you a lot of advantage. In keeping a blog you will likely attract people who are interested in your niche or people who are writing about the same topics. They will eventually become your audience and a part of your online community. Blogs also usually incite discussions from various people. Through blogging, you will not only get potential customers on your comment section but also peers who share valuable information. Blogging requires you to be a little more insightful. You need to think more deeply about a subject in order to write about it. Indeed, research is an important part of writing blogs. As you seek out information in order to give information, you will start to see the value out of your surroundings. These are the only ones that I can think of right now, I may add some more in the the future. Remember: You don’t need to be very good in writing to start a blog. You also don’t need money because you can blog for free.